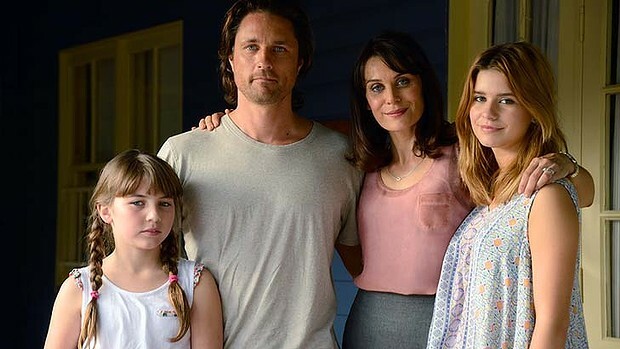 Taking off: Martin Henderson and Diana Glenn as the Gundelach family in Secrets & Lies. One never thinks reporting the finding of a dead body could ever lead them to being named as the number one suspect, but that is exactly what happens to Ben Gundelach (Martin Henderson) in tonight’s brand new drama Secrets and Lies on Channel 10. Thom Murnane (Hunter Stratton Boland), a child well known to Ben and his family has been found murdered and dumped leads to Ben’s life spiraling out of control as Detective Sargeant Ian “The Vulture” Cornielle (Anthony Hayes) places significant pressure on him as the state’s number one suspect in the murder. Set in Brisbane, this six part series is gripping and enthralling and will have you questioning as to who is telling the truth and who is trying desperately to hide their lies. To keep viewers watching and to keep in trend with viewers watching while online, Network Ten are including a multi-platform integration with Secrets and Lies including partnering with Zeebox (users will have access to additional footage, images and audio files during the broadcast) and a Secrets and Lies Website offering a prequel webisode and additions to police interviews and suspect bios all designed to help the viewers work through evidence gathered and attempt to unlock the killer behind the crime. TenPlay will also offer catch-up episodes and behind the scenes footage while Twitter and Facebook followers will be given hints and tips while each episode airs. So is Secrets and Lies enthralling? Completely. Martin Henderson, Anthony Hayes, Adrienne Pickering, Diana Glenn and even the younger cast are all impressive and offer solid performances. Just who did kill young Thom Murnane? Secrets and Lies premieres tonight, Channel 10 at 8:30pm.